Paul said, "Be wise in the way you act toward outsiders; make the most of every opportunity. Let your conversation be always full of grace, seasoned with salt, so that you may know how to answer everyone." I love that! Full of grace, seasoned with salt. 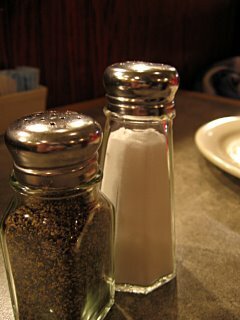 So yes, truth (salt) and grace go together, but you don't go home after a great dinner and say, "Man, I'm so glad they prepared SALT for dinner." Instead, prepare someone a meal of grace, and season it with salt. Love people, invite them over, show them that you really do care that they don't drive through a "road closed" sign, and introduce them to a God who loves them.